Women’s bomber jackets are definitely not a new addition to the bomber jacket trend or category. 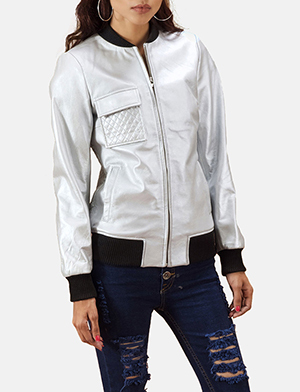 You will see many bomber jacket women express their styles, creativity and moods through unique, striking women’s bomber jackets. 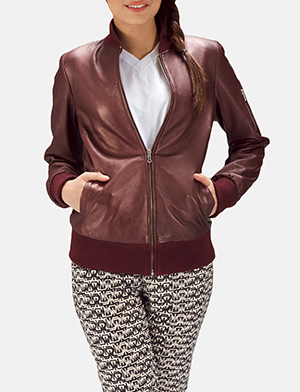 Aviator jackets and flight jackets share the same features and fame as any leather bomber jacket for women. Whether you’d like something classic such as a black bomber jacket, or something cool and alternative which is where we’d say a khaki bomber jacket is the way to go. Pink bomber jackets for women, shout out femininity, while a green ladies bomber jacket can mean a lover of nature. The colours are endless and the styles unlimited. At The Jacket Maker most bomber jackets are made from buffalo or cow hide, sheepskin or lambskin, aniline or semi-aniline treated, distressed or burnished finish or something striking such as tie ‘n’ dye effects that are all the rage. Bomber jackets can also be made in suede, nappa or nubuck. All you have to do is make a request and let us handle the rest. To add further interest value to your women’s bomber jackets, how about trying out something exclusive for yourself, using embroidery, print or a mix of both to add an artsy finish or a unique style where you find yourself owning a special bomber jacket that is a conversation starter.